At last, some rain. You'll not hear me saying that very often but I think we are all glad there has finally been some. I love the smell of rain when it falls after a period of dry weather. I bumped into ST, we had to cower in the hides dodging the showers. We were rewarded with three wood sandpipers on the Budge fields, another wader remains unidentified but was probably a ruff. Once the rain eased, the temperature rose to 18 degrees C, I had a wander around the bushes in the hope of migrant or two. 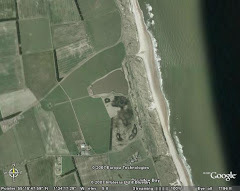 Nothing in the bushes, but seven wheatears and two white wagtails looked newly arrived. I got wet again this evening. 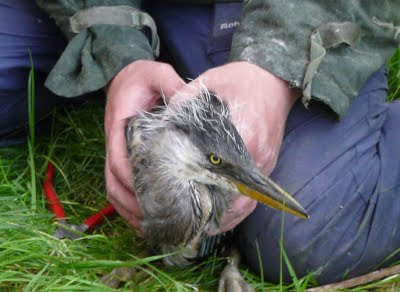 We had another go at ringing the herons in the colony. Eight nests this year (ten in 2010), with three looking to have failed. We ringed three out of four in one nest (the runt was too small) and a single big juvenile in another. In nest number three, four young were still too small and nest number five, they were too big, legging it out across the branches, this lot will be fledged soon. The smell of herons is quite distinctive and hangs on you for ages in contrast to the sweet smell of the rain this morning.